Ludella Hahn is an fetish cosplayer/fitness guru out of Boston Massachusetts. Looks wise she's a throwback to the old school style pinup girls with the coke bottle figures but on top of that she has a pretty twisted imagination which leads to some cosplay video's on her website that can best be described as beyond original. Who else would have Velma from Scooby Doo as a werewolf or Hermione from Harry Potter as an Amazon with fangs? Speaking of fangs it seems she loves to wear them as there are quite a few video's with her as a vampires. It is definitely worth taking a look at and of course she takes orders for customs so if you want control of her look check out her site at www.ludellahahnfetish.com. 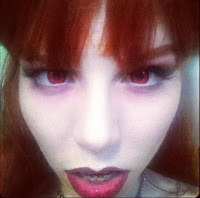 To see her full list of vampire clips click HERE.